Kuta Beach in Lombok is vastly different from its Balinese counterpart. Although slowly gaining popularity, this little stretch of multiple beaches split up by a few headlands is relatively untouched and not tainted by inflated prices and quiksilver surfing boutiques. In recent years it seems the locals have started to recognize the increased tourist influx, and thus every other shop is now a guesthouse or homestay. But the calm, chilled out beach vibe still remains and there’s a really enjoyable atmosphere about the place. When we first arrived we were feeling pretty peckish from the ferry across and the bike down so we asked around for a great local joint. We were quickly told that “Nana’s” was a great place to start. I personally have grown up calling my grandmother my Nana, and thus, anything that shares the same name I relate to comfort, warmth, and delicious food. This Nana’s was no exception. We pulled in, shut off our Honda Vario, and quickly heard the low tones of a local guy strumming away on the guitar inside. Once we opened the small bamboo gates and chose the corner table outdoors that requires you to sit either cross legged or lounge right out on your back, we knew we’d picked the right spot. Nana was quick to show her face (complete with a warm smile) and a kind “thank you for stopping by” – and the man strumming guitar quickly joined our table as songs were played and laughs were shared (we ended up having quite the night on the town with this fellow that ended in us having to sneak away as he screamed into the bands microphone around 1am). But back to the food. The menu is a decent size and consists of mainly Indonesian dishes ranging from 10,000rp – 25,000rp (about $0.80 – $2). 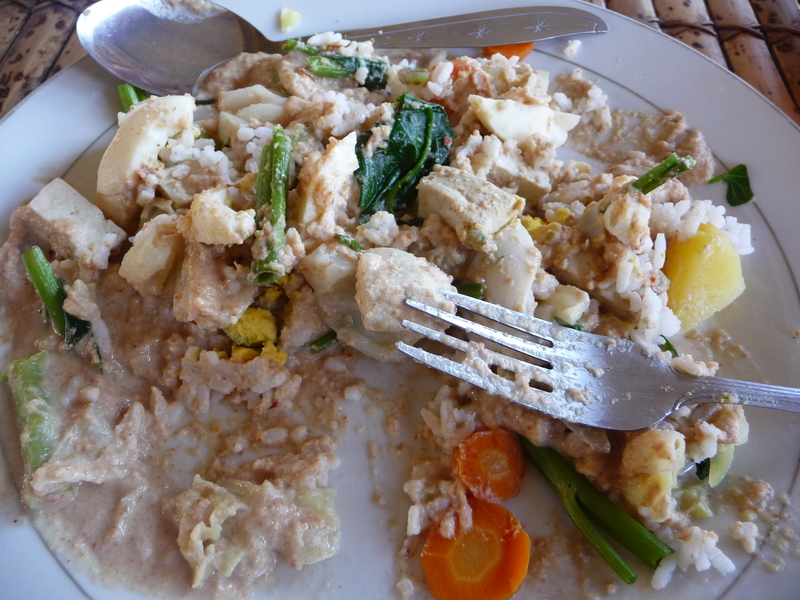 I went for the Gado-Gado – essentially steamed vegetables and tofu, coated in a delicious, warm peanut butter sauce, typically served with rice on the side. 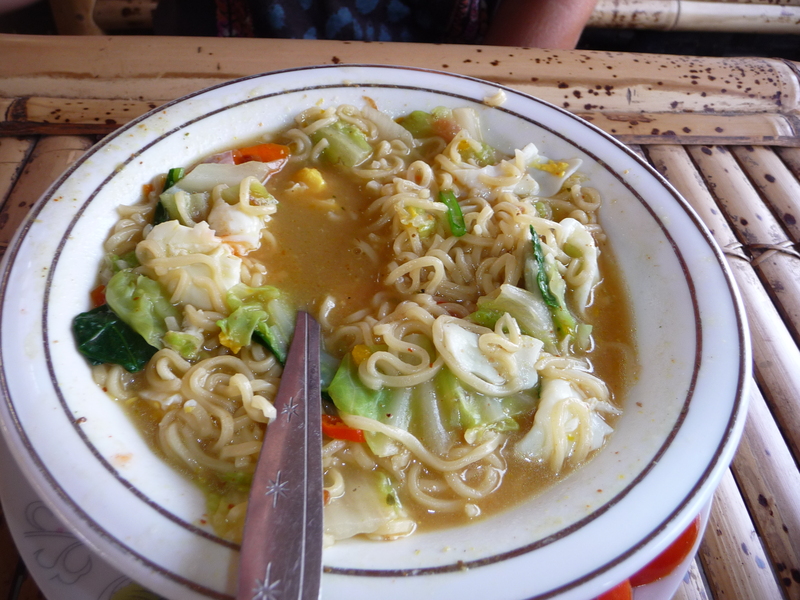 Rose went for Mie Kuah, which is a noodle soup with chicken, veggies, and a soft fried egg. Although the food took a little longer than most Indonesian restaurants, the quality was quickly recognized. Massive proportions, perfectly steamed veggies, a broth with just the right amount of spice, and warm peanut sauce left us feeling happy and full. Although we’ve only spent a couple nights in Kuta (and our breakfast is included in our homestay), we’ve been to Nana’s about 3 times and will definitely be back for more. Good food, a warm atmosphere, and a gracious and smiling host makes this place bring out the subtle comforts of home.